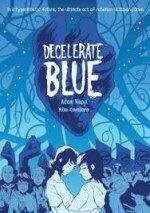 * Nicholas Eskey on Decelerate Blue. * here's one of those time-wasting list articles, but this time about Mike Mignola's Hellboy character. Between you and me, I think nearly all of the bullet points were already reasonably well-known. * shere's a profile of a working cartoonist with a lot of the struggles of a working cartoonist. * finally Bob Mankoff talks to the New York Times about leaving his position as cartoon editor at the New Yorker and what's up next for the 72-year-old cartoonist himself.